The space that plants normally take up on the ground is greatly reduced. For example, a vining winter squash plant can grow to around eight feet long, sprawling all over the garden. Grown up a sturdy trellis, though, that same plant only occupies a couple of square feet of garden space. This is an important consideration for gardeners with limited space. Vertically grown plants are less prone to pests such as slugs, and have better access to sunshine and airflow. Harvesting crops is easier in many cases, with no bending and easier access to ripe vegetables. Vertical supports look wonderful in a garden, adding visual interest and dimension. Imagine a living wall of plants screening an unsightly part of the yard, or a bamboo teepee covered with scarlet runner beans. For kids' gardens, we use rainbow-colored, powder-coated, metal spiral supports, which add a charming splash of color. And here’s an interesting reason to consider growing vertically: Many of today’s modern plants have been hybridized to grow as bushes rather than as vines. Think of tomatoes, green beans, and peas, for example. In most cases these plants have been bred this way to facilitate mechanical harvesting. But older, often tastier, traditional heirloom vegetables in these categories tend to be vines, so we often prefer these varietals over modern hybrids. Vining peas. Sweet peas are not edible, but form a gorgeous, highly scented screen of flowers and pretty leaves when grown up a trellis against a fence or wall or on a freestanding support in a raised bed garden. We favor the type of 4-foot-wide trellis outlined in All New Square Foot Gardening, as it fits our small beds perfectly, and is inexpensive and versatile. 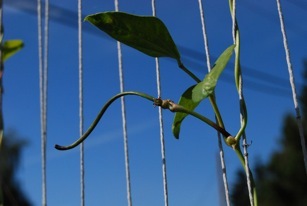 Vining snow peas, shelling peas, and sugar snap peas can all be grown up similar supports. Be sure to look for the word “vining” rather than “bush” on the seed packet. Tomatoes. Most heirloom tomatoes are vining or “indeterminate.” “Determinate” tomatoes are bush types that take up about four times the garden space per plant. 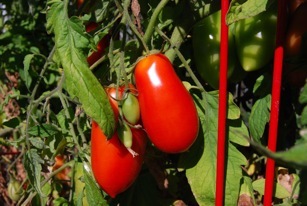 However, there are reasons to grow determinate tomatoes: They’re great in pots or planters because of their compact size, and they can be grown in addition to plants on vertical supports to expand the tomato harvest (important, as tomatoes are by far our most-requested vegetable). Interestingly, the fruit of bush tomatoes tends to ripen all at once rather than gradually, as with indeterminate types. This can be really helpful for folks wanting to can or freeze their tomato crop. We grow our indeterminate tomatoes in tall, sturdy square cages, on trellises, or up spiral supports. Avoid those cheap, flimsy galvanized-steel tomato cages at the big-box stores, which have a strong tendency to tip over when laden with fruit late in the season. We buy our supports from a local wholesaler, but you can find some good ones at online retail sites like GardenersSupply.com. Beans. Green, yellow, scarlet, runner, yard long . . . there are numerous vining or “pole” beans, including some of the old standards like Kentucky Wonder and Blue Lake. Generally, these are among the easiest and tastiest beans you can grow, and are really pretty in the garden. They can be grown up teepees, up a trellis as mentioned above for peas, or even interplanted with sweet corn, as the Native Americans traditionally did. (In a classic symbiotic relationship, beans fix nitrogen in the soil for the heavy-feeding corn, and the cornstalks provide support for the vining beans.) We also love to grow bush beans, it should be noted, as our favorite French haricots verts or filet beans are a bush variety. Plus, bush beans are very productive for the amount of space they take up in a garden, growing only about 4 inches apart. 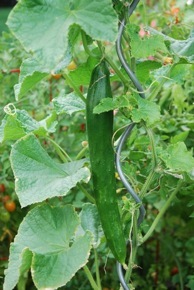 [%image vertical1 float=right width=200 caption="Cucumbers are a delight to grow."]Cucumbers. Cucumbers are a delightful crop to grow — they’re decorative, productive, and take up almost no garden space. They are easy to grow and have pretty yellow flowers. We love them growing up a tall, colorful spiral support, where they make a splashy focal point in the garden. Squash and melons. * Believe it or not, with a sturdy support, most vining squash and melons can be grown right up a trellis. We do this with small cantaloupe and watermelons, small pumpkins, and all kinds of winter squash. A funny-sounding but effective way to support large melons or squash on a trellis is to cut off the legs of a pair of pantyhose and slip the ripening fruit down into the bottom or toe of one leg, then tie the other end up to the trellis. The fruit can continue to ripen and expand right inside the hose support. In a single garden bed, we can often grow more than one crop up the same trellis. For example, if we plant our peas early enough (in late February or early March), we can harvest them and remove the plants in time to put in our tomatoes, cucumbers, beans, or other summer crops in early June. Gardeners getting going later in planting — like now, in early April — may have to choose this year between some of their favorite crops. Or, you may wish to consider adding even more vertical supports to your garden, or perhaps dividing your plants between bush and vining varieties. If you have questions or would like to meet us in person, and you're in the Portland area, be sure to stop by our booth at the Sunday [/market/hfm "Hillsdale Market"] this month. We will be there April 5 and April 19 between 10 a.m. and 2 p.m., as will our grower, Annie of Gales Meadow Farms, who can supply you with a great selection of organic plant starts.